EXCELLENT CONDITION MCCOY MARGARINE CONTAINER! THIS ONE IS FROM THE STRAWBERRY COUNTRY DINNERWARE LINE AND IS THE PRETTY WHITE COLOR WITH BLUE TINGE/OVERCAST COLOR. BOTTOM IS MARKED: MCCOY, LANCASTER COLONY (MARK), USA. SUPER! SUPER NICE MCCOY LISTING WITH ALL ITEMS IN THE ORIGINAL BOXES! THERE’S A 6 CUP TEAPOT (OR COFFEE), 6 CUPS, CREAMER AND SUGAR. TEAPOT IS MARKED: 1418, MCCOY, LANCASTER COLONY (MARK), USA. CUPS ARE MARKED: 286, MCCOY, LANCASTER COLONY (MARK), USA. CREAMER AND COVERED SUGAR ARE MARKED: 1414, USA. ALL PIECES ARE IN EXCELLENT CONDITION (BOXES HAVE SOME WEAR AND TEAR). THIS IS A VERY NICE MCCOY COVERED CONTAINER! 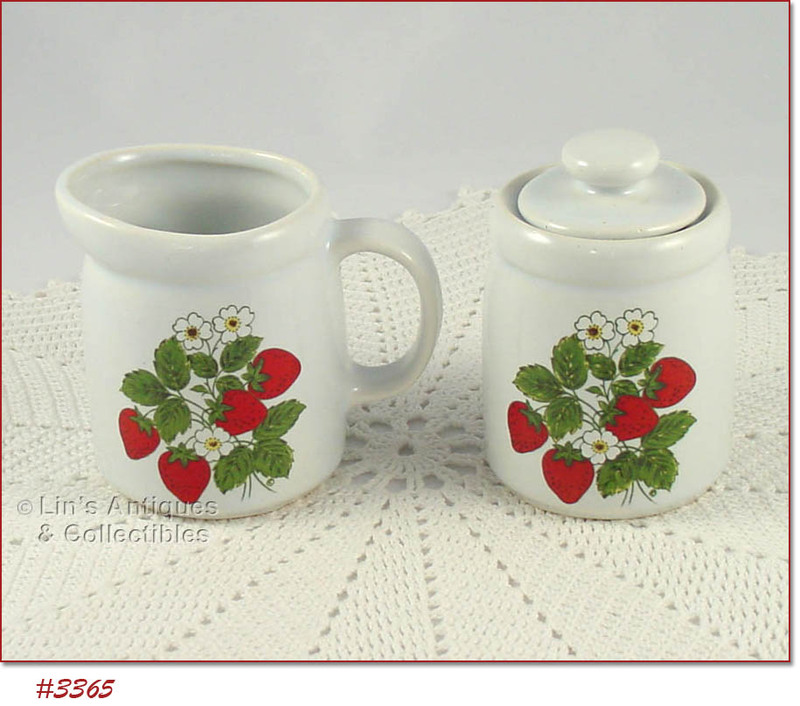 IT’S FROM THE STRAWBERRY COUNTRY DINNERWARE LINE AND BOTTOM IS MARKED MCCOY, LANCASTER COLONY (MARK), USA. 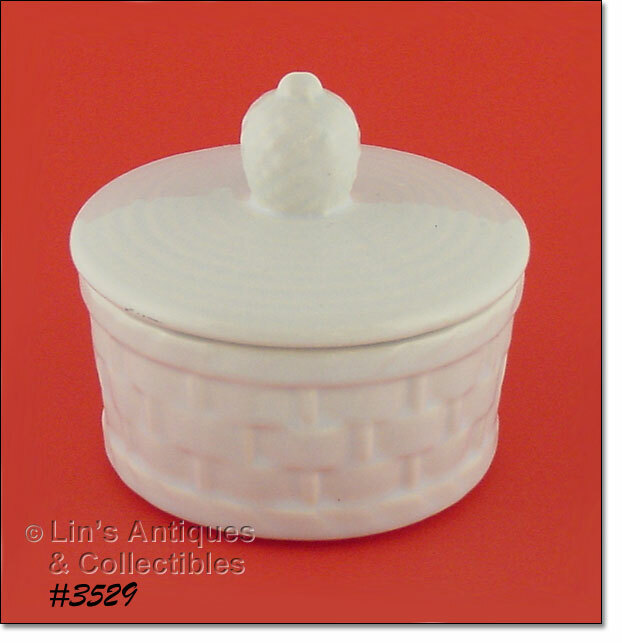 CONTAINER IS IN VERY GOOD CONDITION WITH TYPICAL MCFLAWS – A SMALL STRESS ON LID’S KNOB TYPE HANDLE AND A NON-COLOR/GLAZE ON EDGE OF LID. THE ONLY “USE” EVIDENCED IS A 1/8” SLICED TYPE DING ON LID’S RIM EDGE – THAT’S IT! NICE ITEM, NICELY PRICED! 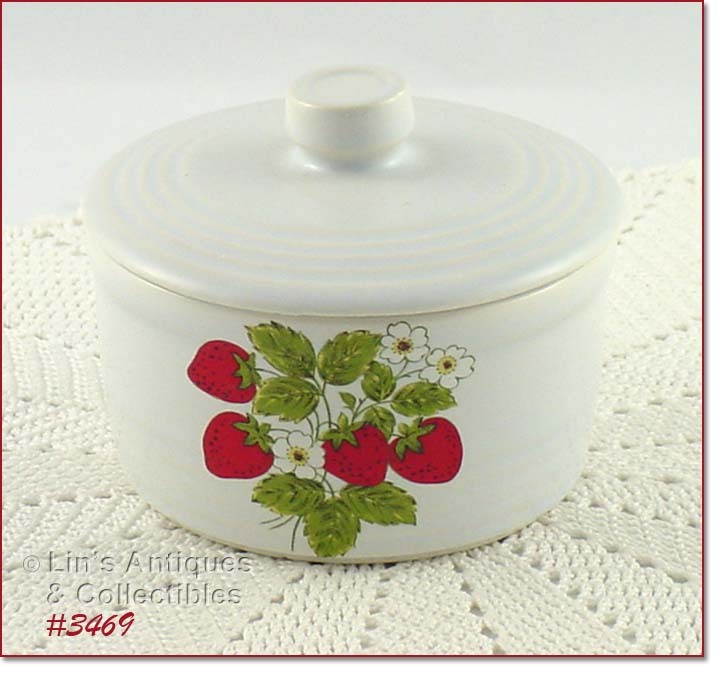 THIS IS A PRETTY MCCOY COVERED CONTAINER FROM THE STRAWBERRY COUNTRY DINNERWARE LINE! MEASURES 2 ½” TALL, 4 5/8” DIAMETER AND BOTTOM IS MARKED: MCCOY, LANCASTER COLONY (MARK), USA. CONTAINER IS IN SUPER CONDITION WITH ONLY EVIDENCE OF “USE” BEING A TEENY 1/16” DING ON EDGE OF LID’S KNOB TYPE HANDLE. SUPER ADDITION TO A COLLECTION! 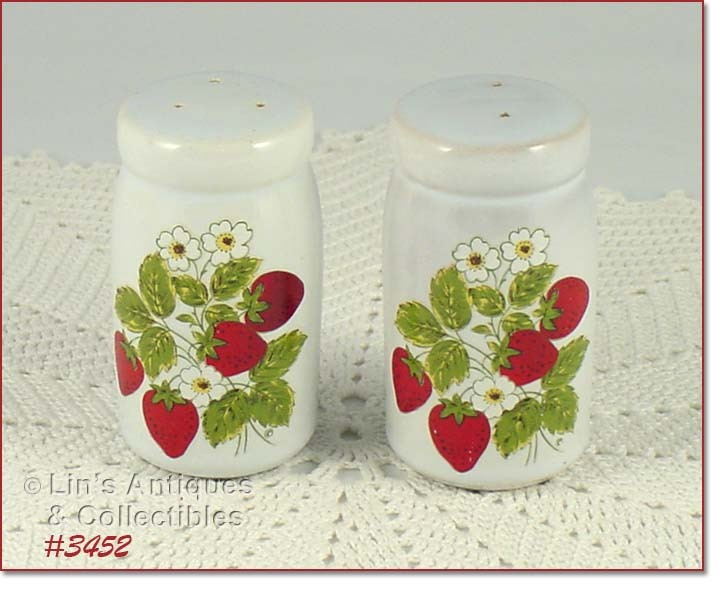 EXCELLENT CONDITION SHAKER SET FROM MCCOY’S PRETTY STRAWBERRY COUNTRY LINE! SHAKERS HAVE THE ORIGINAL PLASTIC STOPPERS. 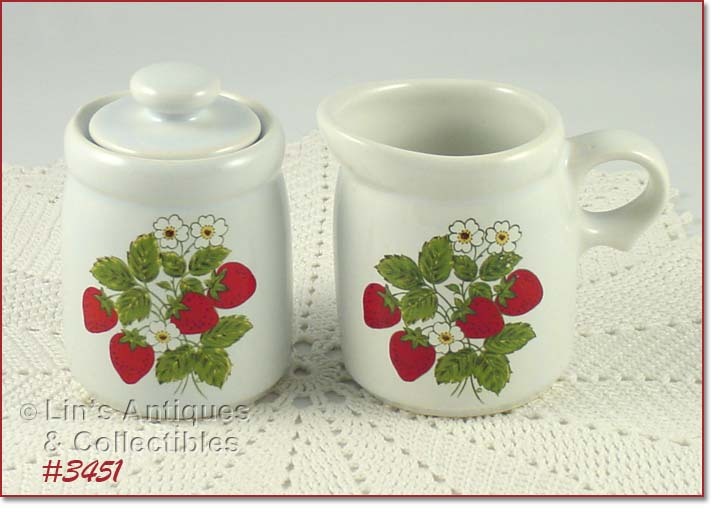 EXCELLENT CONDITION MCCOY CREAMER AND SUGAR FROM THE STRAWBERRY COUNTRY DINNERWARE LINE! 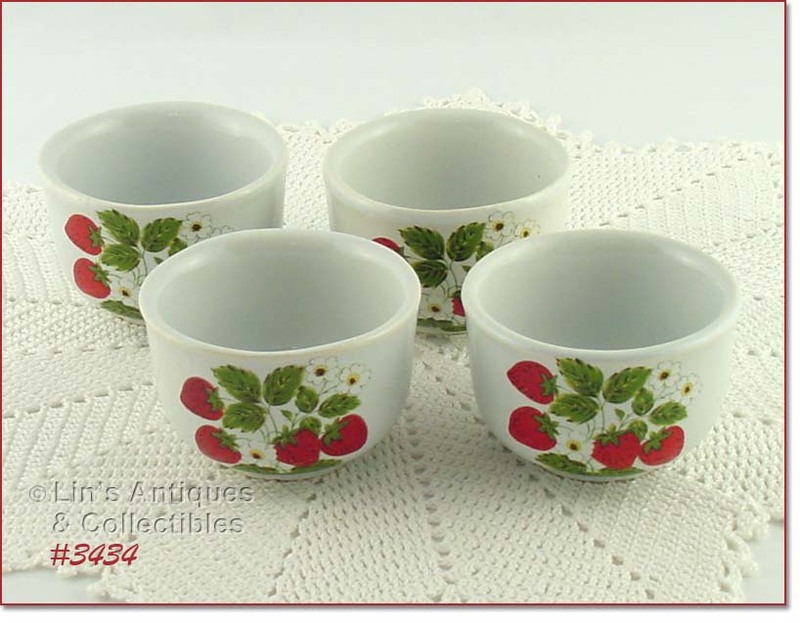 THIS LISTING HAS A SET OF 4 CUSTARDS FROM MCCOY’S STRAWBERRY COUNTRY DINNERWARE LINE! CUSTARDS MEASURE 2 ¼” TALL, 3 ¼” DIAMETER, AND BOTTOMS ARE MARKED: 7010, MCCOY, LANCASTER COLONY (MARK), USA. EXCELLENT CONDITION! VERY PRETTY MCCOY TALL MUGS! 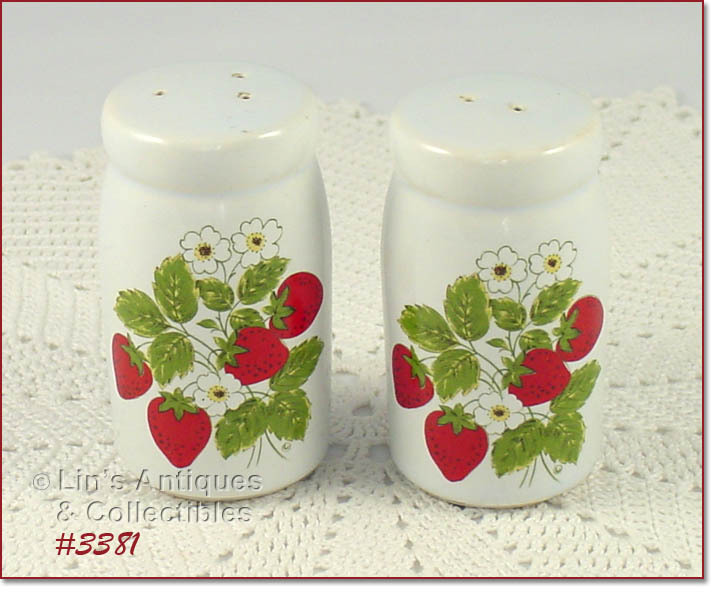 THESE ARE FROM THE STRAWBERRY COUNTRY DINNERWARE LINE AND ARE IN EXCELLENT CONDITION. BOTTOMS ARE MARKED MCCOY, LANCASTER COLONY (MARK), USA. EXCELLENT CONDITION MCCOY SUGAR WITH LID! 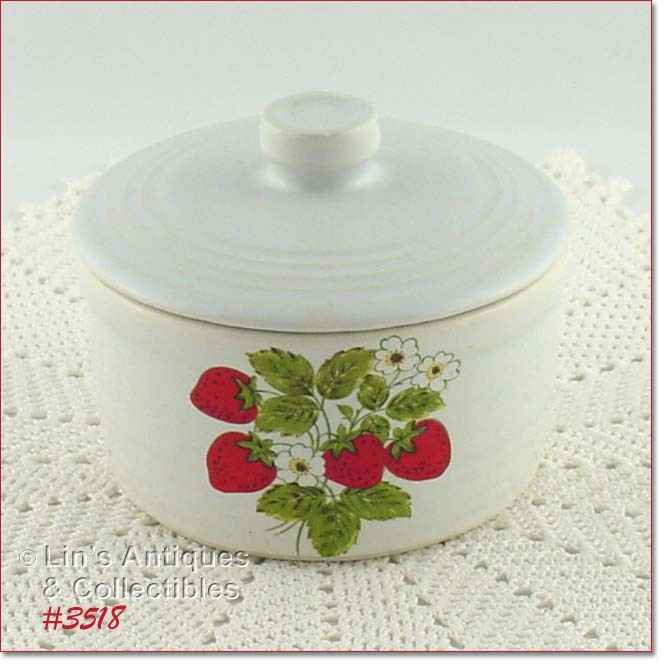 IT’S FROM THE PRETTY STRAWBERRY COUNTRY DINNERWARE LINE AND BOTTOM IS MARKED: 1414, MCCOY, USA. 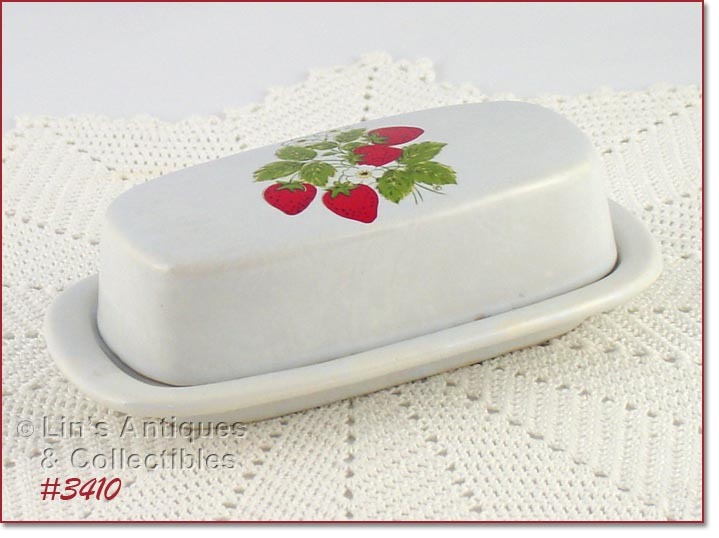 THIS LISTING HAS A COVERED BUTTER DISH FROM MCCOY’S STRAWBERRY COUNTRY DINNERWARE LINE! BOTTOM IS MARKED: MCCOY, 7013, USA. THE TOP’S DRY RING HAS A FEW TINY DINGS/ROUGH PLACES – NOT DETRIMENTAL – AND THE BOTTOM HAS SOME CRAZING – AGAIN, NOT DETRIMENTAL. NICE! 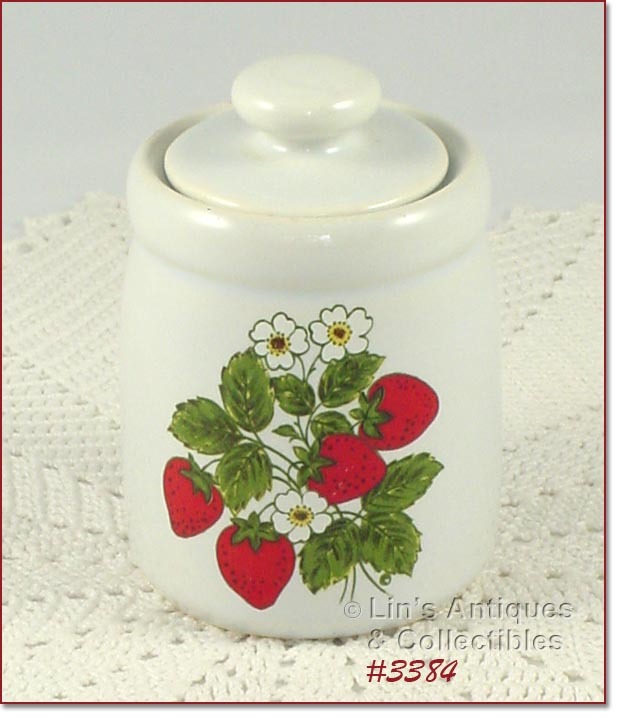 THIS LISTING HAS A MCCOY COVERED SUGAR FROM THE PRETTY STRAWBERRY COUNTRY DINNERWARE LINE! MARKED ON BOTTOM: 1414, MCCOY, USA. EXCELLENT CONDITION! VERY PRETTY SHAKER SET FROM MCCOY’S STRAWBERRY COUNTRY DINNERWARE LINE! 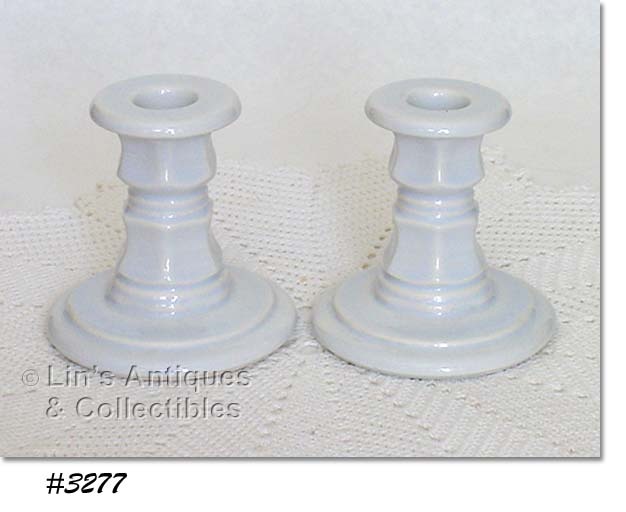 SHAKERS MEASURE 3 ¾” TALL AND ARE IN EXCELLENT CONDITION – STILL HAVE THE ORIGINAL PLASTIC STOPPERS. 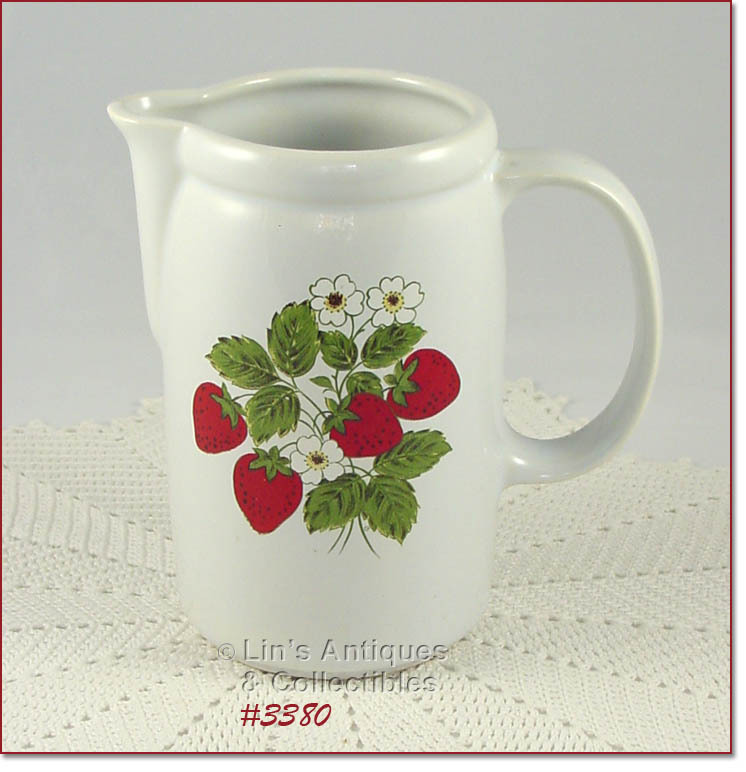 EXCELLENT CONDITION MCCOY PITCHER FROM THE PRETTY STRAWBERRY COUNTRY DINNERWARE LINE! MEASURES 7” TALL AND MARKED ON BOTTOM 1429, MCCOY, LANCASTER COLONY (MARK), USA. SUPER! VERY COLORFUL CANISTER SET FROM MCCOY’S STRAWBERRY COUNTRY DINNERWARE LINE! SET CONSIST OF ONE LARGE, ONE MEDIUM, AND TWO SMALL SIZE CANISTERS AND THEY ARE IN WONDERFUL CONDITION. THE LARGE SIZE HAS LOST ITS’ RUBBER GASKET BUT THE OTHER 3 STILL HAVE THEIR GASKETS. THE ONLY “USE” EVIDENCE IS A ¾” SLICE TYPE CHIP ON THE INNER RIM OF THE MEDIUM LID AND A ¼” ONE ON ONE OF THE SMALL ONES. BOTH ARE ON THE PART THAT SETS INSIDE THE CANISTER AND ARE NOT VISIBLE WHEN THEY ARE ON THE CANISTER. VERY NICE SET, PRICED TO REFLECT MINOR IMPERFECTIONS. 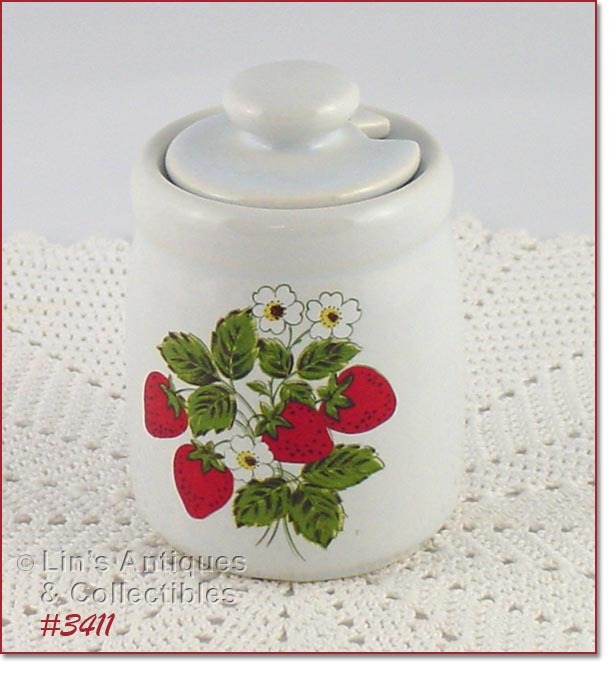 THIS MCCOY LISTING HAS A CREAMER AND SUGAR WITH LID FROM THE PRETTY STRAWBERRY COUNTRY DINNERWARE LINE! MARKED 1414, USA, BOTH PIECES ARE IN WONDERFUL CONDITION – THE LID HAS A COUPLE TINY DINGS ON THE DRY RING – NOT DETRIMENTAL IN ANY WAY! 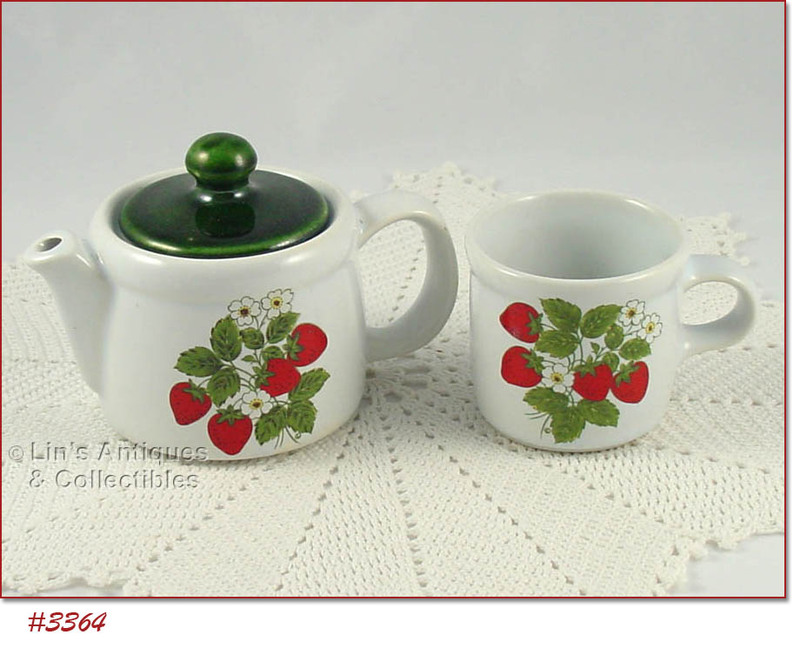 THIS LISTING HAS A 2 CUP MCCOY TEA POT AND TWO CUPS FROM MCCOY'S PRETTY STRAWBERRY COUNTRY DINNERWARE LINE! 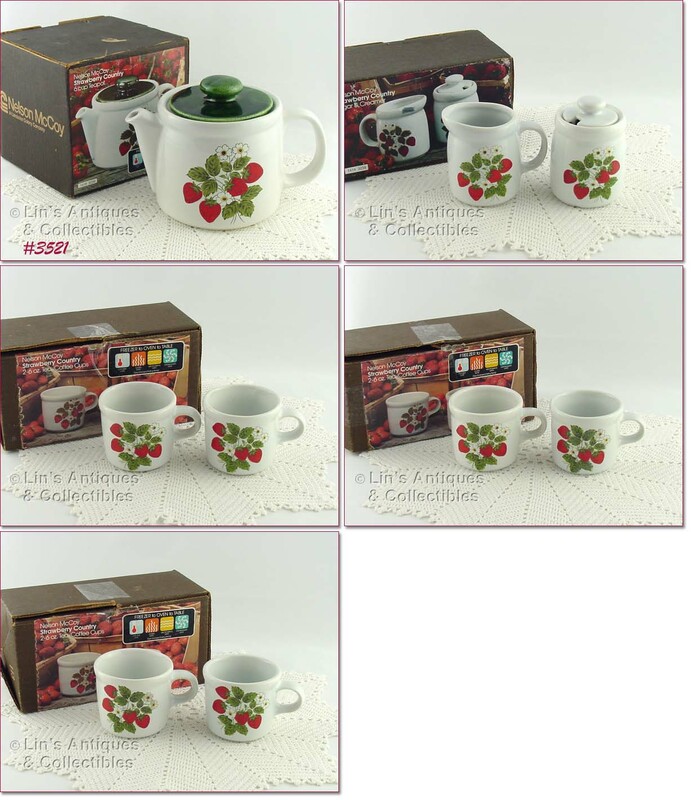 ONLY ONE CUP IS SHOWN IN PHOTO BECAUSE I ADDED ANOTHER AFTER WE LISTED THE ITEM. TEA POT IS MARKED: 7129, MCCOY, LANCASTER COLONY (MARK), USA. CUPS ARE MARKED: 286, MCCOY, LANCASTER COLONY (MARK), USA. ALL ARE IN WONDERFUL CONDITION WITH NO EVIDENCE OF “USE”. TEA POT HAS A PIN-POP AND A NON-GLAZE ON EDGE OF HANDLE – BOTH ARE PRODUCTION AND NON-DETRIMENTAL. 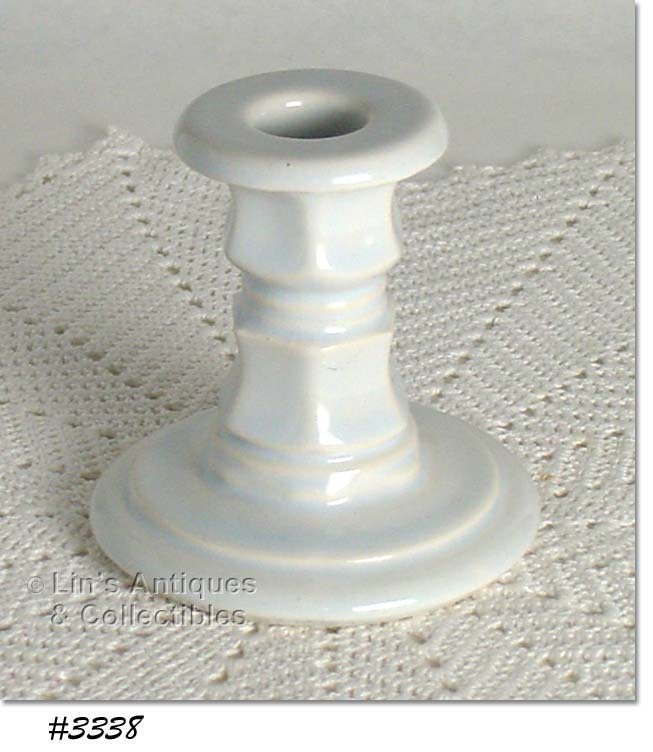 THIS LISTING HAS A SINGLE MCCOY CANDLEHOLDER! IT’S IN THE PRETTY WHITE WITH BLUE TINGE/OVERCAST COLOR OF THE STRAWBERRY COUNTRY LINE BUT DOES NOT HAVE DECALS. MEASURES 3 ¾” TALL AND IS IN WONDERFUL CONDITION – IT HAS A 1/16” GLAZE DING ON LIP (UNDERNEATH) – THAT’S IT! THESE LOVELY CANDLEHOLDERS ARE FROM MCCOY’S STRAWBERRY COUNTRY LINE! THEY MEASURE 3 ¾” TALL AND ARE THE PRETTY WHITE COLOR WITH BLUE TINGE/OVERCAST – THEY DO NOT HAVE DECALS. SET IS IN EXCELLENT CONDITION! 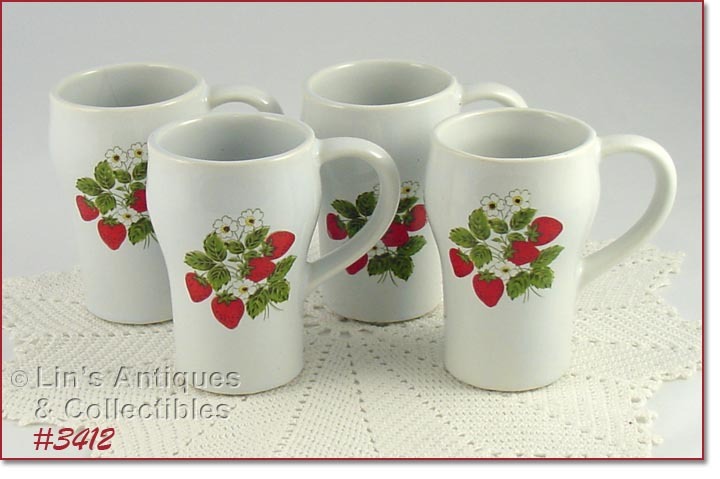 THIS LISTING HAS 4 CUPS FROM MCCOY’S PRETTY STRAWBERRY COUNTY LINE! THESE ARE THE SMALLER SIZE, MEASURE 3” TALL, 3 1/8” DIAMETER, AND BOTTOMS ARE MARKED: 286, MCCOY, LANCASTER COLONY (MARK), USA. EXCELLENT CONDITION! SUPER NICE SOUP MUGS FROM MCCOY’S STRAWBERRY COUNTRY LINE! BOWLS HAVE TWO LITTLE ROUND HANDLES AND BOTTOMS ARE MARKED: MCCOY, LANCASTER COLONY (MARK). THERE ARE 4 SOUP MUGS IN THEIR ORIGINAL BOX AND THE LITTLE MCCOY PRODUCTION BOOKLET IS ENCLOSED. BOX HAS EVIDENCE OF STORAGE/WEAR AND SOUPS HAVE TYPICAL PRODUCTION FLAWS (PIN-POPS, ETC). THESE BOWLS ARE DIFFICULT TO FIND ITEMS IN THIS DINNERWARE LINE.